it's the name of a song I wrote on the Stick, but that song isn't about this sort of loss, (it's open to interpretation, whatever you feel about it is up to you, for me the composer it is about feeling lost when seperated from someone you love, not that different I suppose, although it was only distance that divided us, this page is dedicated to those lost to us still on the material plane. when I update this page I will have more words to say about some of the musicians who we have lost in recent times including George Harrison, Ben Orr, John Entwhistle, Joey Ramone, Deedee Ramone, Aaliyah, Lisa "Left-Eye" Lopes, & Mark Sandman (for whom I wrote the song "Exit Sandman". I think he would appreciate the humour in the title, a play on Metallica's "Enter Sandman") meantime, all I have had time to do so far is move my obituary of Stuart Adamson from our front page to this more appropriate dedication page. 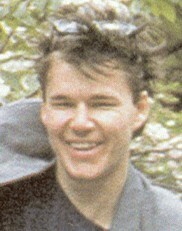 Probably my favourite musician Stuart Adamson succumbed to depression and ended his life. I was devastated by this, Heartbroken, as were all fans of his groups Big Country, the Skids and the Raphaels, his most recent project. My heart goes out to his family and those who knew him personally, it's unfathomable that someone who wrote so much music filled with hope and optimism could've been so depressed. For those who aren't familiar with Adamson's bands the Skids were Scotland's seminal Keltic influenced Punk band in the late 1970's, Adamson's influence on U2's Dave "the Edge" Evans is obvious to anyone who's heard the Skids, and U2 have never denied that. Ironically when Big Country came to the states they were compared to U2, -completely backwards Americans presumed Adamson was influenced by the Edge, whereas I'm sure in Europe early U2 records were noted for their Skids-like guitar sound. I find it fairly an easy task to write a decent sounding song in a Minor key (angry,dark or sad sounding music to those who don't know any music theory), but a great challenge to write GOOD music in a major key (happy chords). Adamson was a genius at both, and wrote more good major key songs than anyone since the Beatles. His use of Ebow, a small hand-held electromagnetic field generator which can make a guitar sound violin-like, among other things, and amazing ability to make his guitar sound like a bagpipe (first perfected I think on the Skids song "Iona"), pizzicatto violin or steel drums,made him that rarest of creatures, an original sounding musician, who not only didn't sound like anyone who ever came before him, but raised the standards of what rock music could be, and, and I'm too depressed to keep sounding like a witty rock critic anymore. They will have played his songs on the radio for a day, but sadly not while he lived. I would trade 99% of the current music industry to have you back Stuart. the Song "Stay Alive" which you can hear on our sound page, takes it's title from Stuart's lyric "in a big country, dreams stay with You, like a lover's voice Fires the mountainside, stay alive" it's what he said at the end of concerts, it became his catchphrase I think. though I'm deeply depressed by this unimaginable tragedy, I will honor his memory by carrying on making the best music I can, battling the mediocrity that plagues the lowest common denominator airwaves of modern radio. 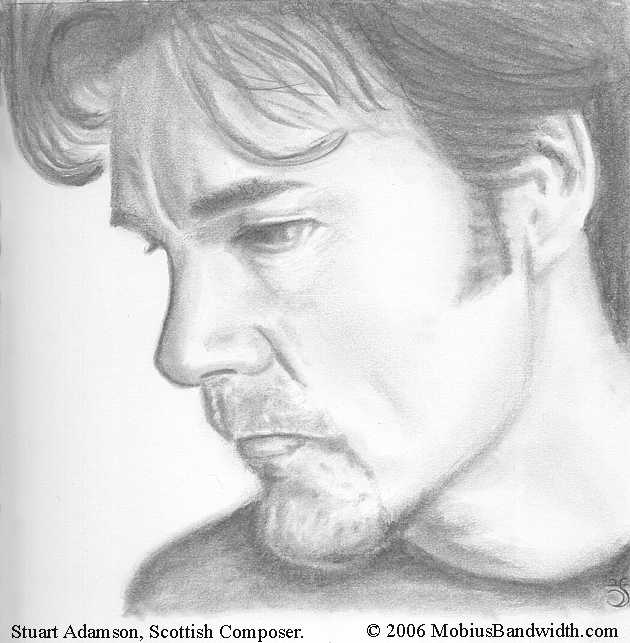 I dedicate the Song to Stuart Adamson, his family and friends. I also have plans to launch a side-project, a tribute band called "Wonderland" in which I will play guitar, Ebow, Bass sometimes, and sing. Interested musicians in Eastern MA should email me. it is still al little ways off. time moves so fast, the days pass like the flash of a spark. the name of this medieval/keltic/rock tune is a line from Big Country's eponymous anthem, features James playing a 30+ year old mandolin. This is the 4th movement of the Cyberfunk suite, a trilogy in 4 (or so) parts of which the first 2 and the 4th are on the CD 'M3'. © James Möbius/MöbiusBandwidth.com 2004 all rights reserved.